Between Sean Manaea, James Paxton, and the Dodgers’ collective effort, we’ve already seen more no-hitters in the first month-plus of this season than we saw in all of 2016 and 2017. Not only are we seeing more no-hitters, we are seeing a lot more games with pitchers taking no-hitters into the later innings. Ben Lindbergh discussed the phenomenon over at The Ringer. This season, we’ve seen 28 no-hitters through five, 20 through six, and nine through seven, all record totals through this point in the year. 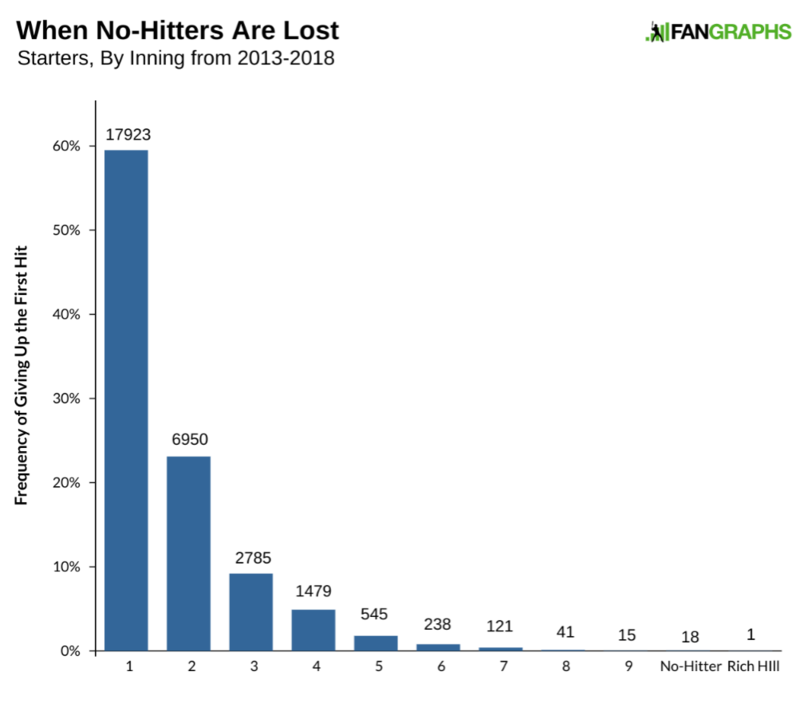 As a percentage of games, no-hitters through five and six haven’t happened this frequently since 1968, and no-hitters through seven haven’t come this fast and furious since 1967. If it seems like you’ve heard about a new near no-hitter on a daily basis this season, you aren’t imagining things. Thus far, at least one team has been held hitless through five innings in 5.3 percent of games. At that rate, a no-hitter through five is more likely than not on any day with at least 20 teams in action. With three no-hitters in tow, that means that so far, there’s been an 11% chance of seeing a no-hitter if the pitcher gets through five innings, a 15% shot if the pitcher gets through six, and a one-in-three chance through seven innings. These odds are considerably higher than historical norms for navigating a game without a hit. Near the end of Lindbergh’s piece, he mentions the notification process for MLB apps and the AP — that is, when MLB alerts followers to a no-hitter in progress. 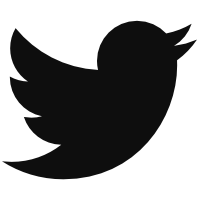 Of course, one is under no obligation to abide by MLB’s preferences when it comes to following along. If that’s true, though, at what point in a contest should one start treating a no-hitter as a possibility? When’s the best time to tune in? This is, ultimately, a subjective decision, of course. That said, there’s no harm to being as informed as possible about making that decision. First, let’s examine when pitchers lose no-hitters. Even with the increase in numbers this season, the removal of a starter who has a no-hitter in progress is still relatively rare, per Jay Jaffe’s article on the subject. We can take all starts and look at when starting pitchers lost their no-hitters over the last five-plus seasons. Most no-hit bids fail to make it out of the first inning. Also note poor Rich Hill, who pitched nine hitless innings and lost his no-hitter in the 10th. There have only been 75 games in a little over five years to make it to the eighth inning. Only around 200 starters made it to the seventh inning with a no-hitter, which is around five or six per month. Add in the sixth inning, and we are talking around three no-hitters per week. Go down to the fifth inning, and we are talking about a game every night of the week. On a purely practical basis, paying extra attention five to six times per month once a no-hitter gets to the seventh seems reasonable for an average fan watching baseball on a regular basis. Three nights per week might be a bit too much. The above analysis deals only with frequency, though. We also want to know how often our diligence will be rewarded with a no-hitter — or, at least, an exciting performance even reasonably close to a no-hitter. On a general level, pitchers who throw no-nos face around 29 batters. Let’s assume that batters will get a hit about 20% of the time, which is slightly lower than the current average right now. 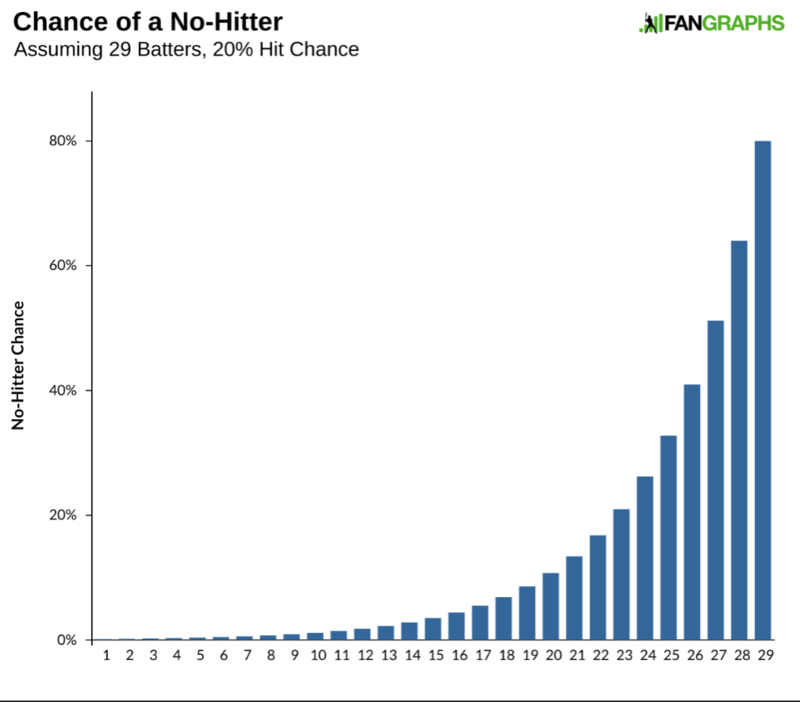 The chart below shows, on the batter level, the odds of a no-hitter at any point in the game for a pitcher who’s held his opponent hitless. This examination deals with one’s tolerance for watching failed no-hitters. If a 5% chance of a no-hitter is good enough for you, then start paying attention right around the start of the sixth. If a 1-in-10 shot is good enough, then the middle of the seventh is where you want to be. If you want a 50/50 shot at history, then don’t tune in until the ninth inning. But maybe 20% is too high. After all, a pitcher’s true talent could peak for the span of a single game. If that happens — particularly against a weak opponent — the odds of a hit might decrease. For comparison, here’s the same chart as above, except assuming hitters have just a 15% chance at a hit. This approach would actually have you paying attention earlier in the game: with a pitcher working at the top of his abilities, a no-hitter is more likely to happen. We can take a similar approach using actual numbers over the past five years. 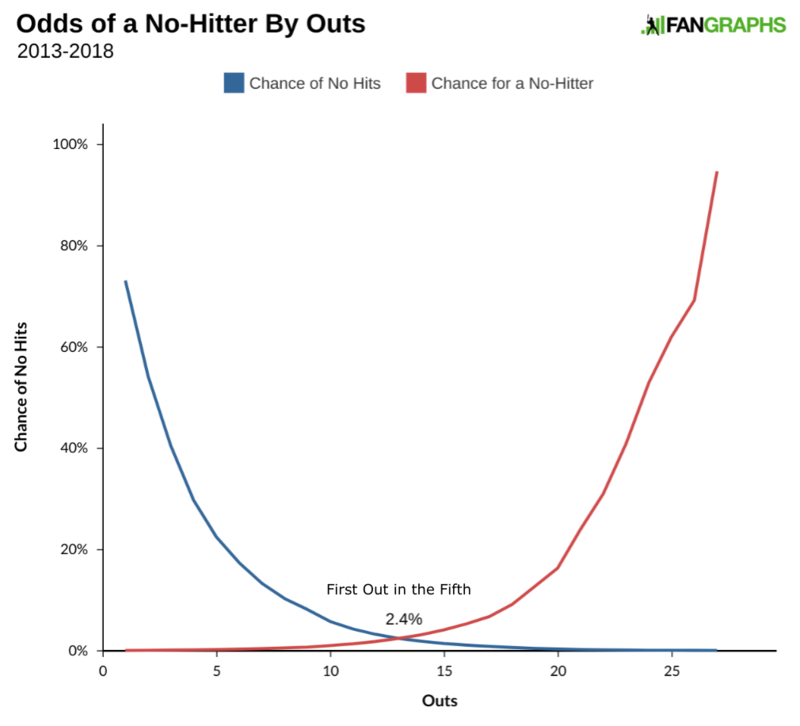 The chart below shows two things: both (a) the odds of a pitcher getting through certain points of the game without any hits and (b) the odds of a pitcher finishing a no-hitter at any point in the game. One could argue that the intersection of those two points is when you should start paying attention because that is when the outing begins to become rare and a no-hitter is at least a plausible possibility. The first out in the fifth inning represents an important moment. 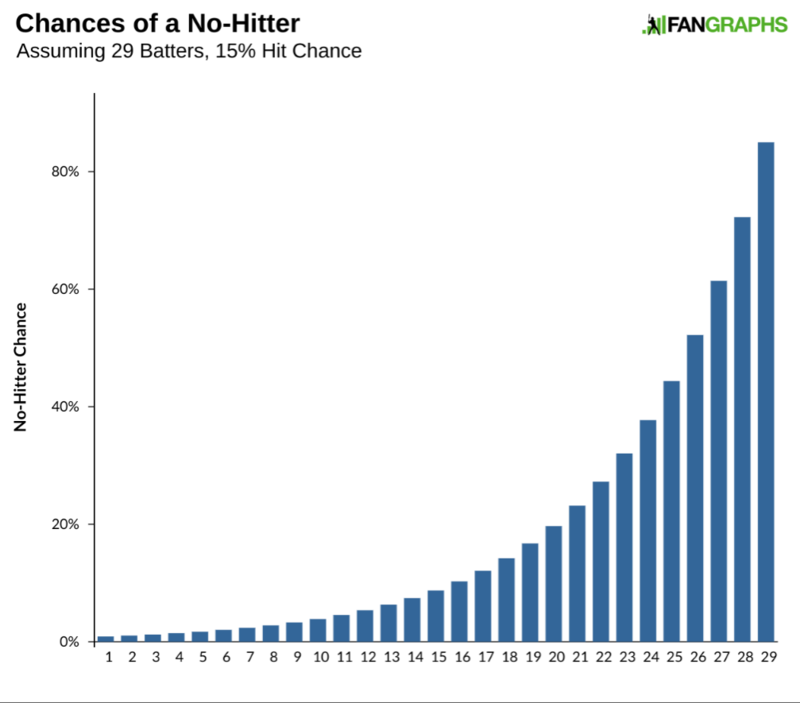 A pitcher has about a 1-in-40 chance of getting a no-hitter that far; he also, at that point, has a 1-in-40 chance of finishing the job. That still feels really early, however. Let’s take another run through the numbers and determine which outs are the most important in getting a no-hitter. To do that, I looked at the percentage change in the likelihood of a no-hitter when the pitcher gets another out. Every out matters, but some outs are more difficult and more important than others in continuing a no-hitter. So what does this tell us? The first out of the game is pretty important. The first really big out of importance in a no-hitter is first out of the fourth inning. The pitcher is typically facing either the first or second batter in a lineup at that point — which is to say, one of the top hitters on the other team. If the pitcher gets that first out, there’s a bit of a lull in importance over the next few innings before it ramps up again as the lineup turns over for a third pass. The last out of the sixth and the first out of the seventh are big. If you want to see the big outs, tune in as the pitcher finishes the sixth inning. If you miss that point, the single biggest out of the game is the final out of the seventh inning. 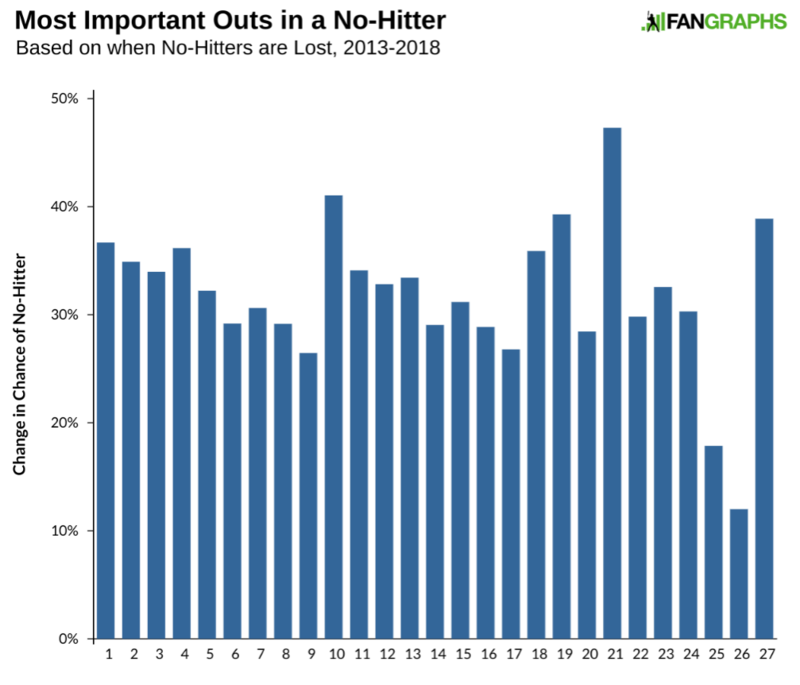 The rest of the outs in the eighth and the first two outs of the ninth don’t do as much to increase the odds of a no-hitter with the final out of great importance. Despite the numbers and graphs, this is still a subjective choice. If you want to tune in every time a pitcher reaches a no-hitter in the fifth inning, feel free. If you don’t want any of the buildup and be sure that a no-hitter is likely, wait until the ninth inning. If you wish to combine the importance of the out, the rarity of the performance up to that point, and the likelihood of a no-hitter reaching completion, the final out of the sixth inning is probably the best time to turn to that game. We hoped you liked reading When Should You Start Paying Attention to a No-Hitter? by Craig Edwards! I would also want to know if the original SP has a chance to go the whole game, so I would look at pitch counts as well. Combined no-hitters aren’t really that exciting for me.